Recovery Partners have delivered extensive rehabilitation support services to help motor vehicle accident claimants navigate back to a complete quality of life. Our services are designed to help individuals overcome these significant hurdles by advocating for the greatest quality of care and maintaining an open collaboration with other stakeholders, to ensure recovery is maximised at every angle. Significant injuries and extended absences pose a major challenge to individuals as it restricts health and well-being. If you've needed to place a motor vehicle accident claim, whether it be for a car, bus, truck or motorbike accident Recovery Partners can offer expert rehabilitation services. We pride ourselves on the value we add and remain thrilled with our results of a 97% success rate with desired outcomes for claimants. Traditional approaches to vocational rehabilitation can be time consuming and place individuals at risk of long term inactivity. Hence, our team's philosophy is that an active recovery is the best practice and we shift the focus from your disability to existing abilities. Recovery Partners operate a holistic, client-centric model which ensures a service flexibility befitting of independent needs of the individual. We recognise the unique challenges of both the person (intrinsic) and environment (extrinsic), and how they implicate an individual’s activity, participation, and performance. Understanding the individual in their entirety is critical to our successes in supporting their injury management, and a biopsychosocial awareness is able to provide an insight toward multiple areas of potential challenge. We welcome your enquiry. Recovery Partners are able to coordinate for an array of references with respect to our Injury Management Services upon your request. 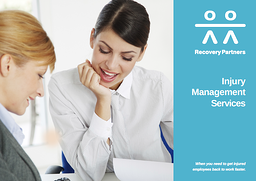 Download our Injury Management brochure for more information on our range of services.